In the above chart you can see the US Gross Federal Debt as a percentage of GDP, updated September 2012. Presidential terms are outlined and highlighted with the color of their party, red for Republican, and blue for Democrat. Projections for 2012 and beyond are based on current US budget. What does this chart show you? This chart shows me that since WW2, successive presidents reduced the national debt relative to GDP until Ronald Reagan (except a small uptick with Ford). But then a different breed of Republican took control of the party. They wanted to shrink government so badly, they resolved to drive the economy into the ground if need be to deliberately create a crisis. Although giving it lip service, they had no intention of balancing the federal budget as fiscal conservatives previously had. To the contrary, they devised an insidious strategy called “Starve the Beast”. The government was the “Beast”. (“Shrink it ’til it fits in a bathtub, and then drown it!” – Grover Nordquist) Their ideology included creating a fiscal crisis so large that congress would have no alternative but to cut spending, especially Social Security, Medicare and Medicaid. Reagan began with a national TV address in which he explained that cutting taxes was like cutting your kid’s allowance, in that with less cash, he would spend less. (Congress was the “kid”.) What he failed to tell us was that the kid doesn’t have a credit card while he and congress do. And with typical Milton Friedman/ Arthur Laugher supply side voodoo economics, he promised that tax cuts (top rate from 70% down to 28% = a 150% increase in take home pay for the wealthy) would stimulate the economy so greatly that our income would increase causing an even greater increase in tax receipts. As you can see by the chart, that didn’t happen as we plunged headlong deeper in debt. Bush 1 continued Reagan’s folly, and then along came Clinton. Fortunately, he had a Democratic congress, who in 1993 passed an Omnibus spending and tax bill without one Republican vote (sound familiar?) that put a balanced budget back on course, and actually began paying off the debt in his second term. 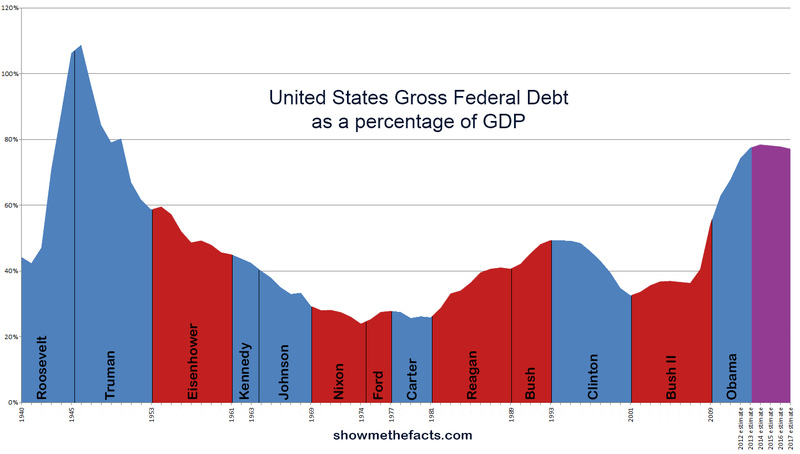 We were set to pay down the debt to almost zero by now, but then Bush 2 beat Gore and Starve the Beast was again off to the races. W cut taxes and didn’t raise them again even in the midst of two unnecessary and expensive wars. Well that, with help from Wall Street and years of deregulation, did it, and by the time Obama was elected the debt had again doubled and the economy was in free-fall with a fiscal crisis so deep, it was termed “The Great Recession”. Although Obama pledged in his campaign to reduce the national debt, neither he, nor the rest of us, knew how deep this recession was going to be, or how fragile the recovery. For four years now, any significant revenue increases or spending reductions would throw the economy back into recession (eg. “Fiscal Cliff”, and yes, the Republicans in congress understand that). The chart therefore shows the the debt increase continued. However, with the already legislated tax increases and spending cuts, should level off in the next four years.